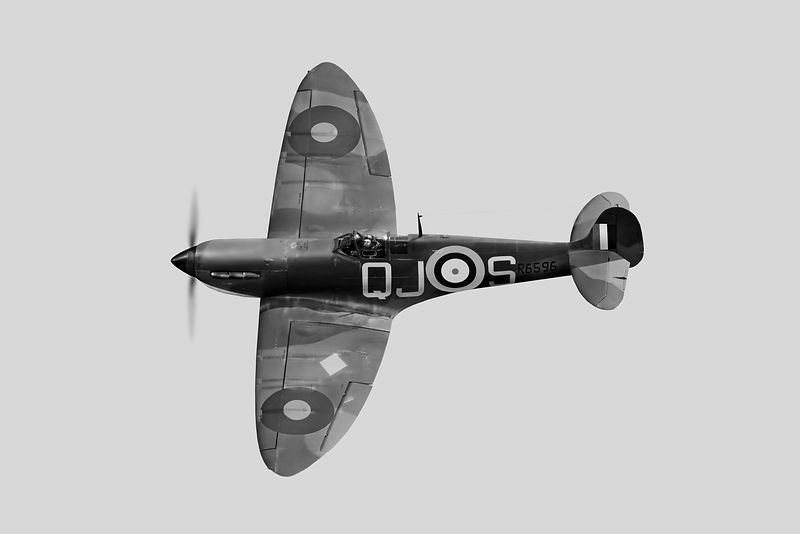 Supermarine Spitfire Mk 1a R6596 portrayed in August 1940 configuration as QJ-S of No 92 Squadron RAF as flown by Alan Wright. Commissioned by Chris Yeoman. In an interview Wright said: "I had first flown R6596 on June 4, and I flew it through August, except on the 23rd. Then, at 4:15 p.m. on September 9, we took off from Biggin Hill and the squadron got split up in a cloud. We were trying to attack a large formation of bombers when I was bounced by Me-109s. My No. 2 and No. 3 dropped back. They were shot down - Sam Saunders and Bill Wading had to bail out. I wanted to get the buggers! I climbed steeply with the throttle through the gate, turning back to get at them, when my Spit was badly hit. One bullet went through the hood and destroyed my reflector sight, so I could not fire back. I managed to evade the Germans and return to base, where I found some bullets had also gone through the propeller. My plane was apparently damaged enough to warrant extensive repairs."